JEL classification: E01, F20, F40, F62. Our existing measurement framework for economic activity in national accounts and the balance of payments is based on an "islands" view of the global economy. Taking the economic area (the "island") as their unit of survey, analysts measure economic activity within the island and the transactions between islands.2 In the simplest case, the workers, production processes, headquarters, management and owners of firms are all located in the same economic area, typically defined by a national boundary. The key concept in national accounts is that of residence. National accounts convey information on the activities of residents on the island. In simple cases, residence is clear-cut. For a firm producing goods in a plant located on a single island, employing workers from the same island and owned by residents on the island, the notion of "residence" for the firm is straightforward. It coincides with the physical location of the firm on the island. If such a firm exports goods, then the goods will cross the boundary of the island into another island. Thus, exports will show up in the customs data for the island. However, "residence" is a legal concept denoting the relationship between an entity and a location. For a person, travelling through another country does not make the person a resident of that country. For a firm, residence is defined as "the economic territory with which it has the strongest connection, expressed as its centre of predominant economic interest".3 But a firm resident on island A can operate elsewhere. For example, it could enter into a contract manufacturing agreement with a firm in island B, and sell the output in island C. The good is shipped from B to C, and never touches the shores of island A. The sale would nevertheless be counted as an export of island A, and would enter its trade and GDP statistics. Island A's GDP would go up even if no workers are employed on the island. Closely related to the notion of residence is that of domicile, which indicates greater permanence. For a person, domicile is a legal concept similar to residence, but which carries additional implications as a place of origin and permanent place of residence. For firms, the term is often used to denote the location of the headquarters. However, there are far-reaching implications from the designation of a particular location as its domicile, as the firm's relationship with its subsidiaries, branches, offices and subcontractors all make reference to the domicile. When a firm moves its domicile, a cascade of other changes follow. The firm's place in the world undergoes fundamental alterations, as its relationship with other jurisdictions is rearranged. The redomiciling of a firm is not just a relabelling, but involves a long list of changes in bilateral relationships between jurisdictions that flow from the alteration in domicile. As corporate activity increasingly straddles national borders, it takes place through many separate legal entities that together span the globe. A manufacturing operation and its workers can be sited far from the headquarters of the firm, and far from its other operations, such as marketing, sales, or research and development. Ownership is also global, since the investors of a listed firm are spread around the world. The jurisdiction in which a company is headquartered (its domicile) may reflect the firm's origin and history, or simply tax or corporate governance considerations. Domicile applies to a firm's assets, which need not be only physical capital but can include intellectual property used to create value. In this article, we go over a number of the key issues raised by the tension between the traditional residence-based measurement system and the evolving nature of globalisation. In many instances, the consolidated approach has the potential to provide a useful alternative perspective. That said, given the increasingly complex nature of the global economy, there are no straightforward ways to comprehensively address many important economic questions using a single measurement framework. Instead, one needs to extract information from multiple frameworks, using an approach tailored to the specific question at hand. The remainder of the article is organised as follows. In the next section, we discuss several important measurement issues associated with the way in which the activities of global firms are recorded under current national accounting rules. Next, we investigate how some of those issues manifest themselves in the data. We conclude by drawing lessons from the above issues. 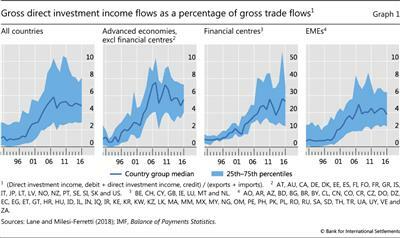 It is now well understood that net concepts such as the current account do not adequately reveal the underlying linkages across countries, which are likely to reflect gross flows to and from different national sectors. 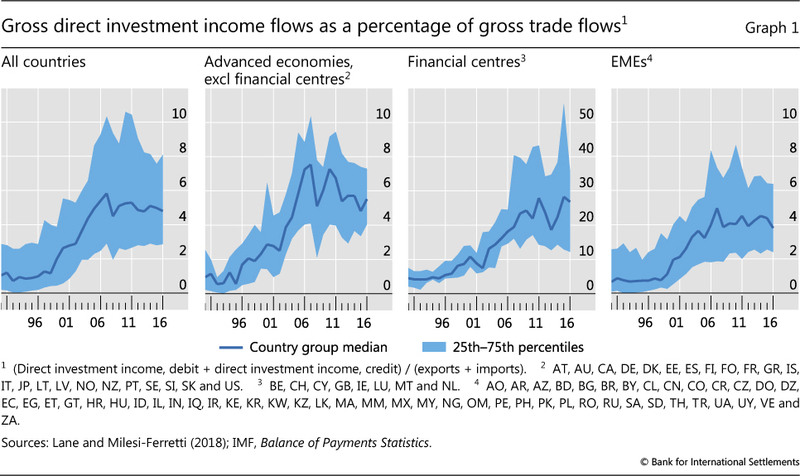 As a consequence of their growing size and complexity, gross capital flows increasingly affect the current account through their impact on primary income. That is why it is necessary to analyse the composition of both gross and net flows, by functional component and sector, even within the confines of the existing residence- based accounting framework (Lane (2013)). This box provides a review of national income measures and their relationship with balance of payments categories. where C and G are respectively the private sector and public sector consumption of goods and services, I represents investment, and NX describes the net exports (exports minus imports) of goods and services. where NPI denotes net primary income, which is the difference between income inflows (credits) from non-residents to domestic residents and income outflows (debits) by domestic residents to non-residents. NX and NPI are components of the current account (CA), which measures the trade in merchandise and services, income inflows and outflows and current transfers of an economy's residents vis-à-vis non-residents in a given period. where NSI is net secondary income, which accounts for unreciprocated payments and receipts (for example, transfers between governments and international organisations such as emergency aid and technical assistance). Primary income can be decomposed further into compensation of employees, investment income and other income (rent and taxes and subsidies on products and production). The investment income category is related to the income generated on international financial assets and liabilities. where SFA is the stock flow adjustment term. This item reflects not only valuation effects due to asset price changes and exchange rate fluctuations but also the reallocation of the ownership of intangible capital assets and financial assets across borders. The NIIP and related investment income - recorded in primary income - comprise five broad functional categories: (i) direct investment; (ii) portfolio investment; (iii) other investment; (iv) reserve assets; and (v) financial derivatives. Direct investment (DI) is a form of international investment that reflects the lasting interest of an entity (direct investor) resident in one economy in an enterprise (direct investment enterprise) located in another economy. A direct investment relation is deemed to exist when a direct investor acquires 10% or more of the voting shares/power of a direct investment enterprise, or owns less than 10% and still maintains an effective voice in management of the direct investment enterprise. The initial transaction between the direct investor and the direct investment enterprise is recorded as DI, as are all subsequent transactions between them. Equity holdings worth less than 10% of the voting shares/power of an enterprise are classified as portfolio investment, along with holdings of tradable securities, such as debt securities (bonds and notes) and money market instruments. The other investment component of the NIIP comprises external assets and liabilities not recorded under direct investment or portfolio investment, namely: loans, currency, deposits, trade credits, derivatives and other accounts receivable and payable. Reserve assets include Special Drawing Rights, monetary gold, a country's IMF position, foreign exchange assets and other claims. Financial derivatives covers a range of products including over-the-counter and exchange-traded contracts (options, futures, forwards and swaps). The residency concept states that the residence of each institutional unit is the economic territory with which it has the strongest connection (expressed as its centre of predominant economic interest). Each unit is a resident of only one economic territory (IMF (2009), UN-EC-IMF-OECD-WB (2009)). The residency approach is consistent with the concept that production and economic activity operate within a boundary or rather on an "island". The complexity of the global activities and corporate structures of multinational firms gives rise to diverging measurements of direct investment by official national statistical compilers. Two primary approaches to measuring direct investment co-exist in the international statistical framework: measurement on the basis of "immediate counterpart" and "ultimate host and source" (OECD (2008), IMF (2009)). 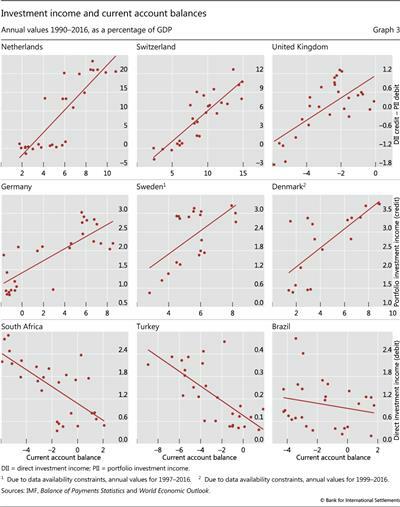 Differences across national statistical agencies in their measurement of direct investment between these approaches, coupled with the persistent rise and increasing complexity of globalisation, have given rise to asymmetries in the mirror direct investment data between countries (CSO (2016)). An IMF initiative, the IMF Coordinated Direct Investment Survey (CDIS) Project on Bilateral Asymmetries, commenced in 2010 with the aim of addressing quality concerns in direct investment statistics (IMF (2015)). For simplicity it is assumed that net errors and omissions and the Capital Account are zero. The Capital Account covers transfers of capital and gross transactions of non-produced non-financial assets (for example, bailouts and debt forgiveness). Data revisions are also included in the SFA component. The notion of a lasting interest implies that there will be a long-term strategic commitment between the enterprises, with capital flows arising from this relationship being classified as direct investment. According to these international statistical standards collectively termed "the 2008 SNA", an institutional unit is defined as a household, corporation, non-profit institution, government unit, legal or social entity recognised by law or society or another entity that may own or control them. In this section, we provide three hypothetical examples to illustrate some consequences of globalisation. We start with the "classical" measurement issues associated with global firms, illustrating how offshoring affects national accounts. Second, we highlight additional conceptual and measurement challenges associated with the redomiciling of global firms - that is, the change of legal domicile of a firm to another location. Third, we describe issues raised by the cross-border mobility of corporate assets, in particular intangible assets such as intellectual property. While we provide three separate examples for simplicity, these phenomena can interact in practice, further complicating the interpretation of balance of payments data. 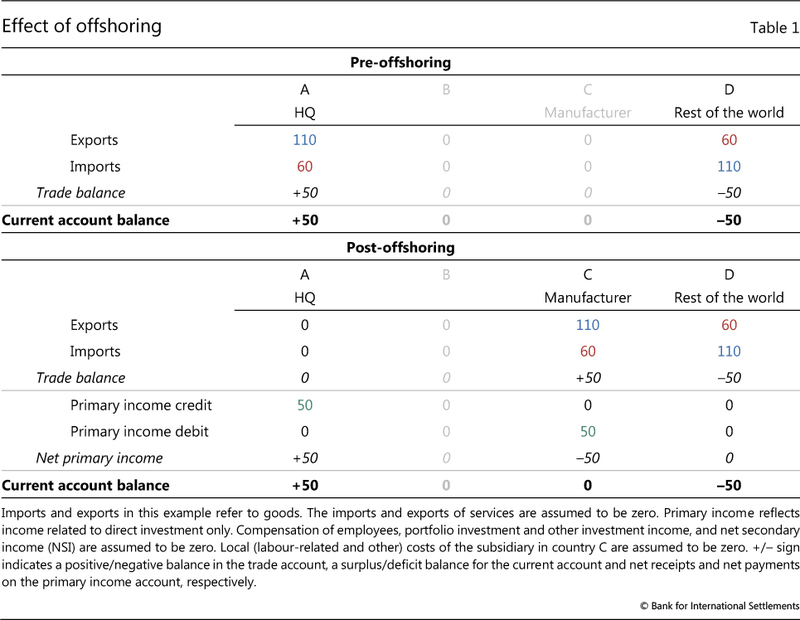 Perhaps the first form of globalisation that comes to mind in popular discussions is "offshoring", where business processes are moved to another jurisdiction, either through the firm's own foreign subsidiary or to an unrelated firm through a contract agreement.9 Offshoring can apply to manufacturing or to support services, such as accounting or back office functions. When the offshoring takes place through an arm's length contract, the offshoring is combined with "outsourcing". Consider an example where the residents of a given country (Country A) produce goods domestically and sell them to the rest of the world. In our hypothetical example, Country A manufactures and exports goods worth 110, using inputs worth 60 that it imports from the rest of the world. 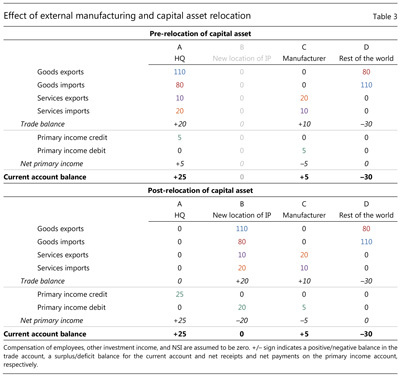 Country A thus has a positive trade balance of 50 and a current account surplus of equal size (Table 1). Now, suppose that the firm offshores the production of its goods to Country C by establishing a foreign subsidiary.10 In this case, the imports and exports of goods no longer show up in Country A. Instead, Country C imports and exports goods vis-à-vis the rest of the world. For simplicity, we assume that local (labour-related and other) costs are zero, so that the profit of the subsidiary in Country C is the difference (50) between the exported final goods (110) and the imported inputs (60). That profit of 50 is channelled from Country C to Country A through the primary income component of the current account. In this way, offshoring transforms the original trade surplus of Country A into primary income net receipts of the same magnitude. 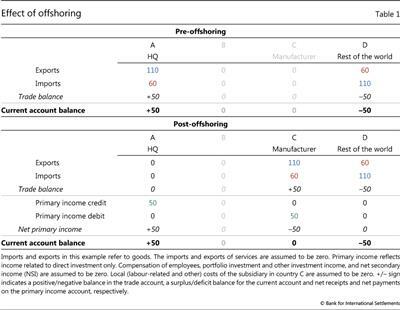 The current account balances of both countries, however, remain unchanged relative to their respective pre-offshoring values (at a surplus of 50 for Country A and a balance of 0 for Country C). Transfer pricing represents another classical measurement issue in international finance. This article does not cover transfer pricing in depth since that subject has been extensively covered by a voluminous literature.11 Suffice it to say that transfer pricing washes out in the current account. Choosing transfer prices to understate domestic profits and overstate foreign profits means that exports are underreported by exactly the same amount that overseas investment income is overreported (abstracting from any resulting tax effects). As a result, the measured trade balance and the measured net investment income are both "inaccurate", but in exactly offsetting ways. Suppose that Country A is the historical home of Firm ABC (Table 2, top panel). The shareholders (portfolio investors) of Firm ABC are also resident in Country A.15 Suppose that firm ABC decides to redomicile its headquarters to Country B (Table 2, bottom panel). Through redomiciliation, the firm relocates its legal incorporation to Country B, but does not generate any additional real economic activity in Country B. The shareholders of Firm ABC continue to reside in Country A, but their original claim on a domestic firm has been transformed into portfolio investment assets of Country A on Country B.17 Country A had previously booked all of Firm ABC's foreign earnings as DI income receipts since its operations in Country C counted as DI. Now, since the foreign assets are held as a portfolio investment, it only receives investment income on the share of income paid out as dividends. This reduces the current account balance for Country A, as some of the firm's profits are held back and added to retained earnings. The converse effect is reported for Country B. It now receives all of the investment income generated by the direct investment assets it has vis-à-vis Country C, but the offsetting entry related to the portfolio equity holdings of shareholders in Country A is only recorded when dividends are paid out. Since the firm keeps back some profit, this boosts the current account of Country B. These effects are not only theoretical possibilities. The effect of corporate globalisation on the national accounts of a number of small open economies has been well known for some time (Beusch et al (2017)). More recently, substantial measurement challenges have also emerged for several large advanced economies. For example, the significant presence of multinational firms in Switzerland is associated with a substantial measured current account surplus (Jordan (2017)). This is in part due to the profits earned abroad by multinational enterprises resident in Switzerland being attributed to that country despite the owners of those firms residing outside Switzerland. Dividend payments to the ultimate owners dissipate some of the profits that flow to the headquarters, but only partially (due to the asymmetrical accounting treatment of DI income and PI income, described above). Conversely, since 2011 the United Kingdom has experienced a deterioration in its net primary income, predominantly reflecting a decline in receipts of investment income inflows (Lane (2015), ONS (2016), Burgess and Shanbhogue (2017)). This has consequences for the interpretation of the evolution of the UK current account, particularly in the light of the increased correlation between the current account and investment income since the early 2000s (Forbes et al (2017)). The rise of the knowledge economy and the use of intellectual property (IP) as capital assets in the production of technology have also had a critical impact on the measurement and interpretation of GDP and balance of payments statistics. IP is a type of intangible asset and includes research and development, copyright and computer software.20 According to the 2008 System of National Accounts (SNA) framework, the booking of exports and imports depends on the economic ownership of IP.21 As a consequence, the relocation of IP across countries, typically motivated by the tax planning activities of global firms, can change the geographical location where exports and imports are recorded. 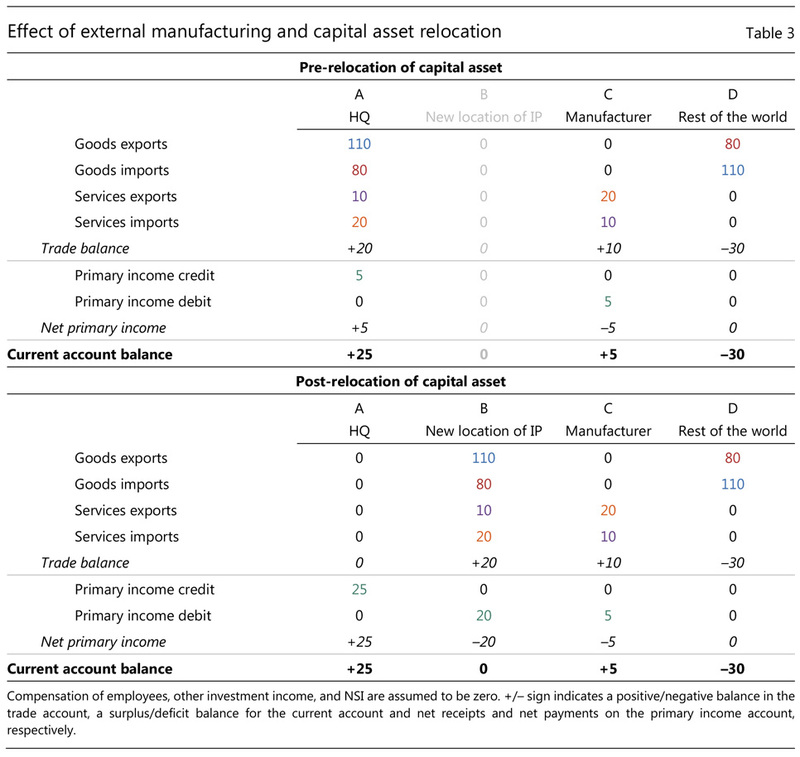 The relocation of mobile capital assets can also affect measured GDP and GNI, via its impact on depreciation. This form of financial engineering is no longer predominantly channelled through offshore financial centres, but also affects the national accounts of advanced economies (for example Ireland, Switzerland, the United Kingdom and the United States). Once again, we use the post-offshoring world from the simple stylised example described in the bottom panel of Table 1 as a starting point. We enrich the example in two ways. First, we now assume that production uses IP inputs. Second, in contrast to the previous examples, we now allow for the existence of local (labour-related and other) costs. Now, suppose the firm relocates its IP assets from Country A to Country B (Table 3, bottom panel). The physical production process remains unchanged, but the relocation of IP assets has implications for the trade balances of A and B. The parent firm in Country A is no longer exporting services related to its intangible assets - this income (to the extent it comes from a third country) is now earned by the subsidiary in Country B, which is now the economic owner of the IP. The subsidiary in Country B is now (i) exporting IP services to the manufacturer in Country C (the subsidiary in B receives a royalty service fee of 10 from the manufacturer in C) and (ii) importing contract manufacturing services from the manufacturer in Country C (the subsidiary in B pays a fee of 20 to the manufacturer in C).24 Furthermore, the exports (110) and imports (80) of goods, which were previously booked by Country A, are now booked by Country B, where the economic ownership of the IP assets now resides.25 Country A receives primary income of 25, comprising 20 from the relocated IP in Country B and 5 from the profits of the manufacturer in Country C.
So far, we have focused on the trade balance. In a baseline scenario, there should be no impact on current account balances, because of the offsetting impact on net primary income. For Country A, the decline in net exports should be exactly offset by the increase in investment income receipts, since the parent in Country A is still the ultimate owner. Similarly, the profits earned by the subsidiary in Country B from exporting IP services to Country C and goods to the rest of the world will be exactly offset by an accrued increase in DI income flowing to Country A. The relocation of IP assets across countries also has implications for international balance sheets. In the scenario we have been discussing here, there will be a shift increase in the external liabilities of country B and the external assets of country A by the corresponding value of the IP relocated, reflected in the stock flow adjustment (SFA) component of the net international investment position (NIIP) (see equation 4 in the box). This is due to the intra-group accounting treatment of the relocation of the IP, which is recorded as an increase in the IP assets of the foreign subsidiary resident in Country B, coupled with a simultaneous increase in the (external) liabilities of the subsidiary to its parent firm in Country A (or some related subsidiary). This will be reflected in a corresponding increase in the external assets (direct investment component) of Country A through the SFA component. The latter two phenomena were recently experienced by Ireland. The relocation of the corporate structures of global firms to Ireland, combined with relocation of intangible assets (in the form of IP) and the increased globalisation of production processes (including contract manufacturing and aircraft leasing), has significantly affected its national accounts. In July 2016, the National Income and Expenditure 2015 results for Ireland reported real GDP growth of 26% and real GNI growth of 19%.26 Following the recommendation of a domestic Economic Statistics Review Group, the Central Statistics Office, Ireland's national statistical agency, published a number of modified economic indicators that account for the distortions arising from the globalised nature of the Irish economy. One example of the modified indicators is GNI*, which excludes the investment income flows related to redomiciled global firms, the depreciation of intellectual property products and distortionary effects related to aircraft leasing (Lane (2017)). This section has offered stylised examples of how globalisation in its many complex and dynamic forms has increased the complexity of accounting for the activities of global firms in the international statistical framework, and therefore the interpretation of a key economic indicator and its components. In the next section, we examine the quantitative importance of these restructuring developments. The post-World War II increase in global external financial openness accelerated sharply between the mid-1990s and the GFC.27 Spurred by financial liberalisation and innovation, external assets and liabilities surged from a combined total of less than 150% of GDP in 1995 to over 400% in 2007 (Lane and Milesi-Ferretti (2018)). The GFC seemingly brought to a halt the rapid rise in external financial openness, with the global stock of external assets and liabilities contracting to slightly under 400% of GDP in 2015 (BIS (2017b)). Given the expansion in gross assets and liabilities, a focus on the trade balance when measuring external imbalances ignores the dynamics of international trade in financial assets (Lane (2015), Lane and Milesi-Ferretti (2018), Forbes et al (2017)). The importance of gross primary income flows (relative to gross trade flows) rose steadily between the mid-1990s and the GFC. This largely reflected the rapid pre-crisis expansion of the stocks of cross-border financial assets and liabilities (discussed above). This trend was most pronounced for financial centres (FCs), where the ratio of gross primary income flows to gross trade flows more than quadrupled from 14% in 1995 to 65% in 2007. The relative importance of primary income flows also rose considerably for (non-FC) advanced economies (AEs) - from 12% in 1995 to 23% in 2007. The post-GFC pullback in gross external financial positions (together with the low interest rate environment) reversed this trend, but only partially. The 2015 level of the ratio of gross primary income flows to gross trade flows was still roughly three times that in 1995 for FCs. By contrast, the respective ratio remained relatively flat for EMEs both before and after the GFC. Delving deeper into the main components of primary income flows reveals that the relative importance of direct investment income has increased sharply since the 1990s (Graph 1). This is the case not only at the global level, but also for all major country groups. The rise is especially notable in the case of FCs. The increase was primarily driven by the growth of offshoring. 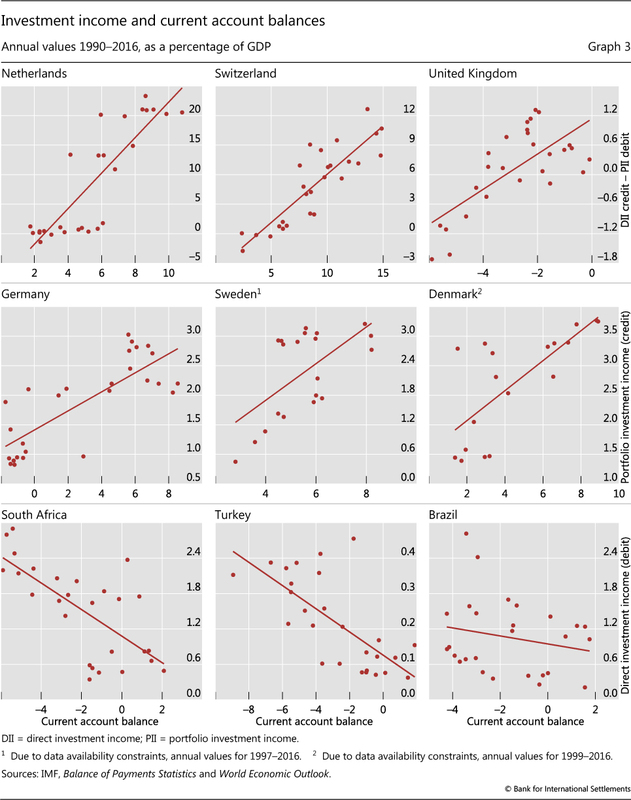 Some country experiences highlight the incidence of these trends (Graph 2). 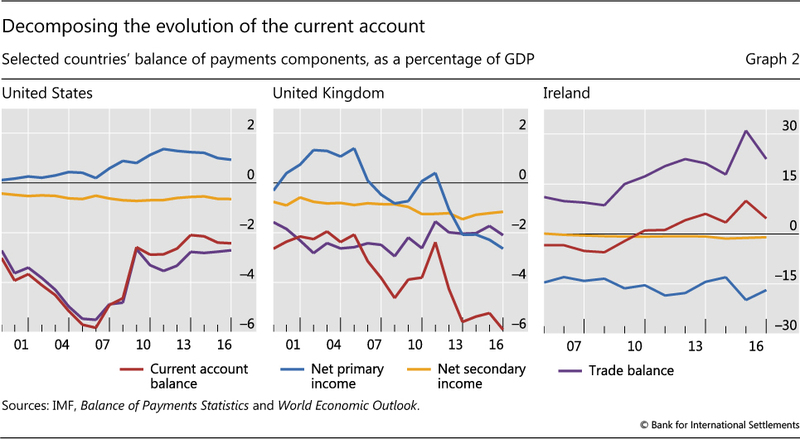 In the case of the United States, the growing (positive) net primary income component of the current account has partially offset its trade balance component (Graph 2, left-hand panel). As a result, it has driven a considerable wedge between the current account balance and the trade balance during the post-crisis period. By way of contrast, as documented by Lane (2015), Forbes et al (2017) and Burgess and Shanbhogue (2017), the primary income component has played a substantial role in the post-crisis deterioration of the current account balance of the United Kingdom (Graph 2, centre panel). 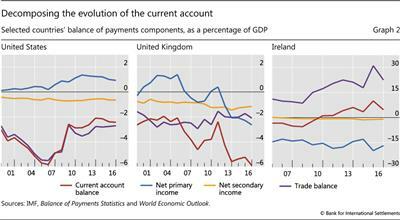 In the case of Ireland, the primary income component of the current account is close to a mirror image of its trade balance component (Graph 2, right-hand panel). Interestingly, the contribution of primary income to the Irish current account balance exceeded that of net exports of goods and services even before the GFC, reflecting the presence of significant multinational corporate activity. The increased relative importance of direct investment income (DII) flows (illustrated in Graph 1 above) suggests that global firms' foreign profits merit special attention. Conceptually, there are three types of corporate profits that could affect the measurement of domestic and national income for a given country (Table 4). First, the profits of domestically headquartered corporates operating in the home country are recorded as part of both domestic and national income. The profits of corporates in that group do not affect the current account (top left-hand cell). Second, the profits of domestically headquartered corporates operating abroad contribute to national income, but are not a part of domestic income. These are recorded as DII-credits and boost the current account (bottom left-hand cell). Third, the profits of foreign-owned corporates operating in the home country contribute to domestic income, but are not a part of national income. They are recorded as DII-debits and have a negative impact on the current account (top right-hand cell). As a consequence, one can expect to find the following empirical relationships in the data. First, for countries (such as FCs) in which global firms tend to be headquartered, there should be a positive correlation between the current account balance and the portion of direct investment income that is not paid out to shareholders, measured as the difference between DII (credit) and PII (debit). Second, for countries (such as AEs) in which the shareholders of global firms tend to reside, there should be a positive correlation between the current account balance and PII (credit) . Finally, for countries (such as EMEs) that tend to host the operations of global firms, there should be a negative correlation between the current account balance and DII (debit). Graph 3 presents evidence for the existence of the above relationships. The top panels reveal that there is a strong positive correlation between the portion of direct investment income that is not paid out to shareholders and the current account balances of three FCs (the Netherlands, Switzerland and the United Kingdom) that host the headquarters of internationally active corporates. Similarly, there is a strong positive correlation between the PII (credit) flows and the current account balances of three AEs (Germany, Sweden and Denmark) in which the shareholders of many global firms tend to reside (middle panels). Conversely, there is a strong negative correlation between the DII (debit) flows and the current account balances of three EMEs (South Africa, Turkey and Brazil) that host the operations of global firms (bottom panels). 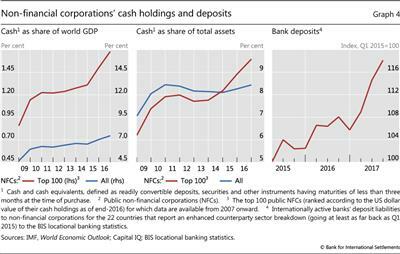 The increase in the undistributed profits of global corporates has manifested itself not only in the current account balances of a number of countries, but also in the evolution of the cash holdings of large multinational non-financial corporates (Graph 4). 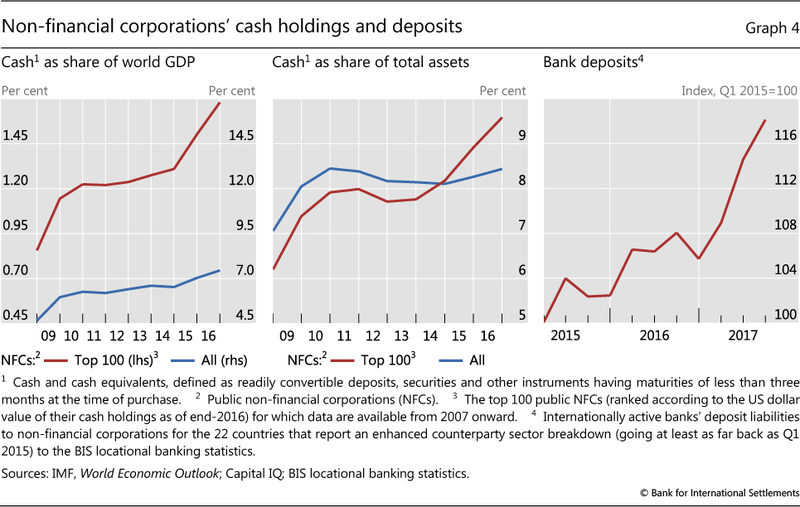 Those cash holdings have risen sharply since the GFC (Graph 4, left-hand panel) and account for an increasing share of corporate assets (Graph 4, centre panel). As a result, the conventional notion of non-financial corporates (NFCs) acting exclusively as borrowers in international financial markets has become increasingly outdated. NFCs have grown to become important lenders to a number of major sectors. For instance, NFCs provide credit to sovereigns and corporates via their bond purchases. NFCs are also important providers of funding to banks. As illustrated by Aldasoro et al (2017), banks outside the United States have reported considerable increases in their US dollar-denominated deposits from non-banks since the GFC. This source of funding has more than offset the run-off of eurodollar deposits by US money market funds that took place in 2016 (BIS (2017a)). The recently enhanced counterparty sector dimension of the BIS locational banking statistics reveals that NFCs' deposits in BIS reporting banks have grown by nearly 20% between end-March 2015 and end-September 2017 (Graph 4, right-hand panel). Thus, the undistributed profits of NFCs have contributed to keeping global liquidity conditions relatively loose, despite a number of factors pulling in the opposite direction. Given the measurement issues discussed in this special feature, policymakers should exercise caution when using rules of thumb developed for a bygone era. For example, debt/GDP and credit/GDP ratios may not be good measures of financial system vulnerabilities for some countries, as the denominator does not adequately capture the size of the domestic economy. Unfortunately, the current national accounting framework creates obstacles to the accurate interpretation of key economic indicators by stakeholders including the official sector, financial market participants and researchers. The complexity of global firms indicates that additional measures are necessary. Such measures should augment the traditional national accounting framework by looking through the "islands" with the ultimate goal of creating consolidated national accounts. A number of data initiatives now under way point to progress in addressing these problems, as recognised in the G20 Data Gaps Initiative. These include the Legal Entity Identifier initiative to identify distinct legal entities and link them to the ultimate parent group;29 the various data sets collected by the BIS on a consolidated basis - eg the consolidated banking statistics, the G-SIB data hub collection and the international debt securities; Ireland's concept of GNI*, which strips the depreciation of foreign-owned capital assets from the measurement of domestic income; and the foreign affiliate trade statistics. The residence-based and the consolidated accounting frameworks should be considered complementary rather than mutually exclusive. The consolidated accounting framework, while newer and more suited to addressing some of the measurement issues discussed here, is not unconditionally superior to the residence-based framework along all dimensions. Instead, its real benefit would be in providing a useful supplementary perspective, whose relevance would naturally depend on the question that is under investigation. Aldasoro, I, T Ehlers, E Eren and R McCauley (2017): "Non-US banks' global dollar funding grows despite US money market reform", BIS Quarterly Review, March, pp 22-3. Avdjiev, S, R McCauley and H S Shin (2016): "Breaking free of the triple coincidence in international finance", Economic Policy, vol 31, no 87, pp 409-51. Bank for International Settlements (2017a): 87th Annual Report, June, Chapter V.
--- (2017b): 87th Annual Report, June, Chapter VI. Bénétrix, A, R McCauley, P McGuire and G von Peter (2017): "The consolidated wealth of nations: a first step", mimeo, February. Bernard, A, B Jensen and P Schott (2006): "Transfer pricing by U.S.-based multinational firms", NBER Working Papers, no 12493, August. Beusch, E, B Döbeli, A Fischer and P Yeșin (2017): "Merchanting and current account balances", The World Economy, vol 40, no 1, pp 140-67. Borio, C and P Disyatat, (2011): "Global imbalances and the global crisis: link or no link? ", BIS Working Papers, no 346, May. Borio, C, H James and H S Shin (2014): "The international monetary and financial system: A capital account historical perspective", BIS Working Papers, no 457, August. Burgess, S and R Shanbhogue (2017): "A prince not a pauper: the truth behind the UK's current account deficit", Bank Underground, Bank of England, 7 December. Central Statistics Office (2015): "Redomiciled PLCs in the Irish Balance of Payments". --- (2016): "Explaining Ireland's FDI asymmetry with the United States". Curcuru, S, C Thomas and F Warnock (2013): "On returns differentials", Journal of International Money and Finance, vol 36, issue C, pp 1-25. Everett, M (2012): "The statistical implications of multinational companies' corporate structures", Central Bank of Ireland, Quarterly Bulletin, no 2, Box 3. Fitzgerald, J (2013): "The effect of re-domiciled PLCs on Irish output measures and the balance of payments", Quarterly Economic Commentary Research Note, Economic and Social Research Institute, no 2013/1/2. --- (2015): "Problems interpreting the national accounts in a globalised economy - Ireland", Quarterly Economic Commentary Special Article, Economic and Social Research Institute, June. Forbes, K, I Hjortsoe and T Nenova (2017): "Current account deficits during heightened risk: Menacing or mitigating? ", Economic Journal, vol 127, no 601, pp 571-623. Gravelle, J and D Marples (2014): "Corporate expatriation, inversions, and mergers: tax issues", Congressional Research Service Report prepared for the Members and Committees of Congress, 27 May. Guvenen, F, R Mataloni, D Rassier and K Ruhl (2017): "Offshore profit shifting and domestic productivity measurement", NBER Working Papers, no 233324, April. Hines, J (2000): International taxation and multinational activity, National Bureau of Economic Research. Inter-Agency Group (IAG) on Economic and Financial Statistics (2015): Consolidation and corporate groups: an overview of methodological and practical issues, IAG reference document, October. International Monetary Fund (2009): Balance of payments and international investment position manual. --- (2015): "Revisiting global asymmetries - think globally, act bilaterally". Jordan, T (2017): "High Swiss current account surplus: consequences for SNB monetary policy? ", speech at University of Basel, Faculty of Business and Economics, November. Lane, P (2013): "Capital flows in the euro area", European Economy Economic Paper, no 497, April. --- (2015): "A financial perspective on the UK current account deficit", National Institute Economic Review, National Institute of Economic and Social Research, vol 234, no 1, pp 67-72, November. --- (2017): "Notes on the treatment of global firms in national accounts", Economic Letter, no 1, Central Bank of Ireland. Lane, P and G Milesi-Ferretti (2018): "The external wealth of nations revisited: international financial integration in the aftermath of the global financial crisis", IMF Economic Review, forthcoming. Lequiller, F and D Blades (2014): Understanding national accounts: Second edition, OECD Publishing, Paris. McCauley, R, A Bénétrix, P McGuire and G von Peter (2017), "Financial deglobalisation in banking? ", BIS Working Papers, no 650, June. Obstfeld, M (2012): "Does the current account still matter? ", American Economic Review, vol 102, no 3, pp 1-3. Office of National Statistics (2016): "An analysis of the drivers behind the fall in direct investment earnings and their impact on the UK's current account deficit". Organisation for Economic Cooperation and Development (2008): "OECD benchmark definition of foreign direct investment: Fourth edition". Setser, B (2017): "Dark matter. Soon to be revealed? ", Council on Foreign Relations blog, Follow the Money, 2 February. --- (2018): "The impact of tax arbitrage on the U.S. balance of payments", Council on Foreign Relations blog, Follow the Money, 9 February. Shin, H S (2012): "Global banking glut and loan risk premium", IMF Economic Review, vol 60, no 3, pp 155-92. Stapel- Weber, S and J Verrinder (2016): "Globalisation at work in statistics-Questions arising from the 'Irish case'", EURONA: Eurostat Review on National Accounts and Macroeconomic Indicators, no 2(2016), pp 45-72. United Nations, European Commission, International Monetary Fund, Organisation for Economic Cooperation and Development, United Nations and World Bank (2009): "System of National Accounts 2008", Sales, no E 08 XVII 29.4. Voget, J (2011): "Relocation of headquarters and international taxation", Journal of Public Economics, vol 95, no 9, pp 1067- 81. 1 The authors would like to thank Iñaki Aldasoro, Raphael Auer, Ryan Banerjee, Claudio Borio, Stijn Claessens, Benjamin Cohen, Branimir Gruić, Robert McCauley, Bruno Tissot and Philip Wooldridge for helpful comments, Bat-el Berger and Zuzana Filkova for excellent research assistance, Anamaria Illes for assistance with the data on corporate balance sheets and Conor Parle for bibliographical assistance. Mary Everett developed parts of this work while visiting the Bank for International Settlements under the Central Bank Research Fellowship Programme. The views expressed in this article are those of the authors and do not necessarily reflect those of the Bank for International Settlements, the Central Bank of Ireland or the European System of Central Banks. 2 The national accounting framework comprises the suite of macroeconomic and financial statistics on the evolution of flows and stocks for an economy and its institutional sectors, as well as their interactions with residents and non-residents. For an introduction to the system of national accounts see Lequiller and Blades (2014). 3 IMF (2009, p 70). According to the international statistical framework, residency is expressed as the centre of predominant economic interest. Each institutional unit is a resident of only one economic territory. An institutional unit is defined as households, corporations, non- profit institutions, government units, legal or social entities recognised by law or society, or other entities that may own or control them. 4 Strictly speaking, there are several different ways to consolidate group-level information, depending on whether one adopts a supervisory, statistical or business accounting viewpoint (IAG (2015)). 5 The country in which economic decisions are taken may be different from both the country of residence and the country of headquarters. 6 There are several data sets that represent notable exceptions to the above pattern. We discuss those in the last section of this article. 7 Lane (2015, 2017), Forbes et al (2017), Guvenen et al (2017). 8 Obstfeld (2012), Borio and Disyatat (2011), Lane (2013), Shin (2012). 9 Contract manufacturing occurs when a firm in a domestic economy engages another firm abroad to manufacture products on its behalf. The ownership of these manufacturing inputs is retained by the firm in the domestic economy, and the contract manufacturing is accounted for as a service in the current account framework. 10 Offshoring in this example assumes a direct investment relation between Country A and Country C. In practice, offshoring does not necessarily have to be performed by a foreign subsidiary (ie it can be performed by an unrelated party). 11 See among others Hines (2000), Bernard et al (2006) and Curcuru et al (2013). 12 For the impact of corporate tax strategies on the US balance of payments, see Setser (2017, 2018). 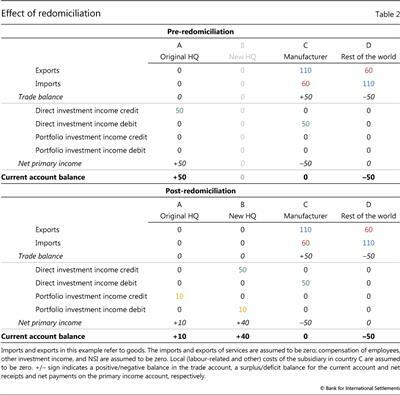 13 The increase in redomiciliation is most likely motivated by the tax planning activities of global firms when faced with the prospect of changes in the tax regime in some jurisdictions (Fitzgerald (2015), Lane (2015), Voget (2011), Gravelle and Marples (2014)). 14 In practice, global firms are likely to have many foreign subsidiaries across numerous countries. 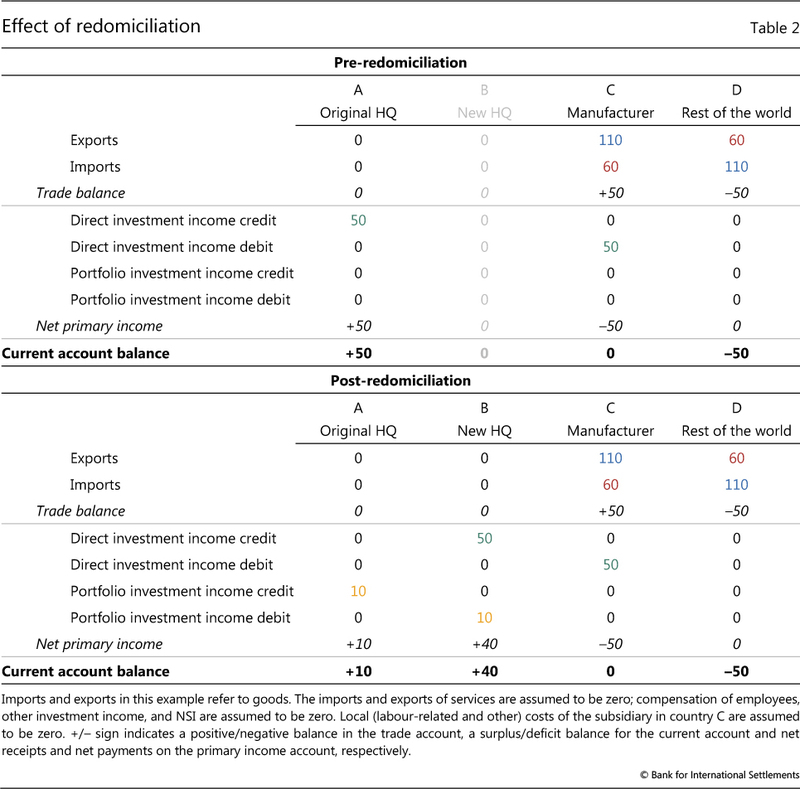 This example focuses on a two-country restructuring to provide an overview of redomiciliation. As in the example presented in Table 1, we assume that local (labour-related and other) costs of the subsidiary in Country C are zero. 15 In practice, the ownership structure of global firms is both complex and global in nature. 16 Retained earnings boost the value of direct investment liabilities, so that the increase in the measured current account balance should be matched by an increase in the stock-flow adjustment term in the stock of direct investment liabilities. 17 The above example assumes that no single shareholder owns more than 10% in Firm ABC. 18 See Borio et al (2014) for a detailed discussion of the relation between the current account and financial account in the balance of payments. 19 While net primary income is overstated, it continues to be negative on a net basis, reflecting the investment income payments to parents of multinational firms with subsidiaries resident in Ireland. For more detail, see Everett (2012), Fitzgerald (2013), Lane (2015), and CSO (2015). 20 IP is formally defined in the current international statistical framework as "the result of research, development, investigation or innovation leading to knowledge that the developers can market or use to their own benefit in production because use of the knowledge is restricted by means of legal or other protection" (paragraph 10.98 of UN-EC-IMF-OECD-WB (2009)). 21 The 2008 SNA framework distinguishes between legal ownership and economic ownership (see paragraph 2.47 in UN-EC-IMF-OECD-WB (2009)). 22 For a detailed discussion see Stapel-Weber and Verrinder (2016). 23 The production inputs of goods under a contract manufacturing arrangement remain under the economic ownership of Country A. Country C is providing a manufacturing service as part of this subcontracting production process. 24 In practice, there will also be a negative effect on the net profits of the foreign subsidiary through the recording of depreciation on the capital stock. For simplicity, the explicit treatment of depreciation is not included in this stylised setup. See Lane (2017) for detailed information on the effects of depreciation on the current account when the domestic capital is owned by a foreign investor. 25 A change in economic ownership takes place when the final goods are sold by Country B to the rest of the world. 26 The relocation of IP to Ireland boosted GDP through (i) a one-time increase in investment and (ii) an increase in contract manufacturing, which gave rise to greater trade in goods and services. It also led to a significant increase in the recording of depreciation, due to the increased stock of capital (ultimately legally owned by a foreign parent), which positively affected GNI. 27 The post-World War II increase in external financial openness was a part of the second major wave of globalisation. The first major globalisation wave, which lasted from the early 1800s to World War I, also saw a substantial increase in both real and financial cross-border linkages. 28 As discussed earlier, these undistributed profits should be captured in the financial account of the balance of payments under the reinvested earnings component of direct investment and affect the dynamics of the net international investment position (since, all else equal, the value of portfolio equity liabilities should rise in proportion to the scale of retained earnings). The net international investment position, however, receives less attention than the traditional current account balance.